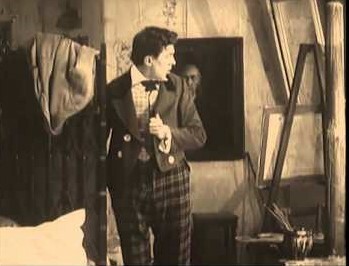 NOTRE DAME DE PARIS (1911) was directed in France by Albert Capellani based on Victor Hugo’s THE HUNCHBACK OF NOTRE DAME. 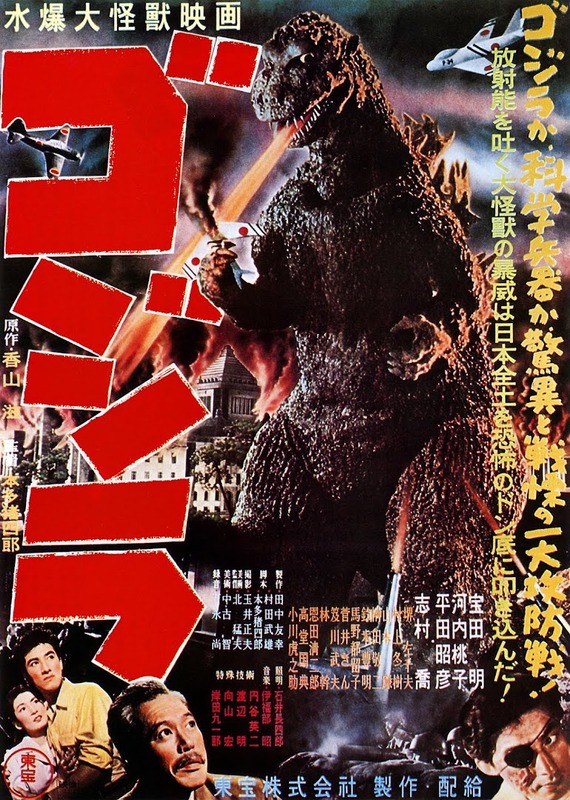 It bore the same name as the novel’s original French title and is believed to be the fourth filmed version. Sadly, as with the previous ones, it is lost barring a few interesting photo stills. 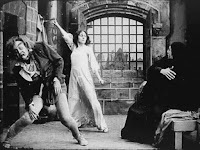 These depict Henri Krauss’s Quasimodo tortured on the pillory, Stacia Naperkowsa as Esmerelda stretched on the rack presided over by Claude Garry’s cruel Frollo, then the damsel saving Frollo from the hunchback’s attempted revenge murder and finally her ushering out of this religious tormentor after saving him. In each, the costumes and sets authentically suggest the Middle Ages period, the actors’ gestures are caught in bold expression and Krauss conveys what we see of Quasimodo’s deformity via an inwardly buckled-knees stance, an elevated left shoulder and a shaggy wig with pain-wracked heavy make-up. Other countries began to see the opportunities in horror cinema during these years. 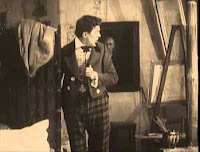 In 1915 Russia gave us simple but effective chills with THE PORTRAIT (1915), V. Starevich’s simplified one-reel (nine-minute) dramatization of Gogol’s short story about a penniless artist (A. Gromov) who buys a painting from a dealer and upon taking it home to his cramped little garret finds that the portrait comes to life. Its subject (I. Lazarev) leaves the frame, stalks the room and then suddenly vanishes, haunting the feverish young man no more. This adaptation sheds any real characterisation of the artist, who in the novella is persuaded into a Faustian bargain of easy fame by the portrait, Gogol’s pointed cynicism about human weakness in the face of temptation. Here he is merely a reactive quasi-victim. Levarev though is eerily commanding as the portrait, facially resembling a demonic Milo O’ Shea. We cut in for a striking close-up as the painted face turns slowly to face his owner. The otherwise traditionally static camera placement actually becomes a plus when he creeps hypnotically out of the picture frame. Russia itself would contribute to cinema language a decade later with the innovative ‘montage editing’, famously popularised by Sergei Eisenstein in STRIKE and BATTLESHIP POTEMKIN (both in 1925) whereby a series of different images are cut together to show events and reactions from multiple sources in quick succession, condensing time and moving the plot along.